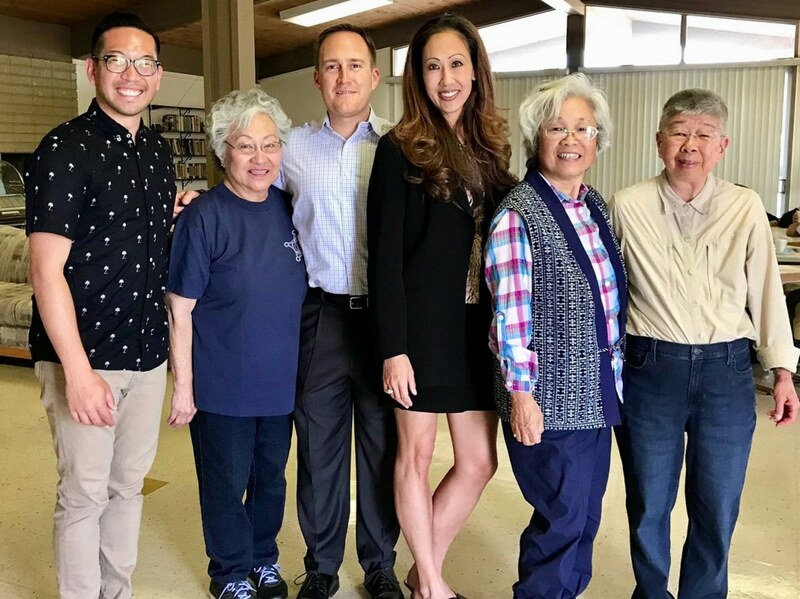 Erin Sato, U.S. Secret Service special agent, was the speaker at the Greater L.A. JACL’s monthly program on May 6 at the Merit Park Recreation Hall in Gardena. She showed a USSS film and answered questions. Sato, who was Miss Tomodachi on the 1998 Nisei Week Court, applied to Secret Service in 2001 after seeing a similar film. One of her assignments was to guard Malia and Sasha Obama, which she did for 2½ years. She is now in the Los Angeles Field Office as a back-up supervisor in the Protection Squad. Pictured from right: Louise Sakamoto, GLA programs chair; Miyako Kadogawa, GLA board member; Erin Sato; Chris Maier, Secret Service special agent and Sato’s husband; Janet Okubo and Kurt Ikeda, GLA co-presidents.